I wanted to share my little Valentine Tree with you all that I have in my little corner chair with drawer. Have I told y'all that I am loving my little chair and drawer? It's so much fun to decorate. I wanted to display some cute little heels that I have. I don't have many but I do love them. Several have been gifted to me over the years. The pretty little gold one above was the first heel that I was ever gifted. Y'all know I name things so her name is Gena. Red Rose sure glitters and I love me some glitter! I actually found her on the clearance rack at Walmart a few years ago after Christmas. I named this particular silver heel "A night on the town with Judy". Awe, and this red unique shoe's name is Debbie. I have had her for many years. My friend Debbie passed away some years ago and I will always treasure this sweet gift. Miss Georgia is a beauty. Her name is Georgia Elizabeth. 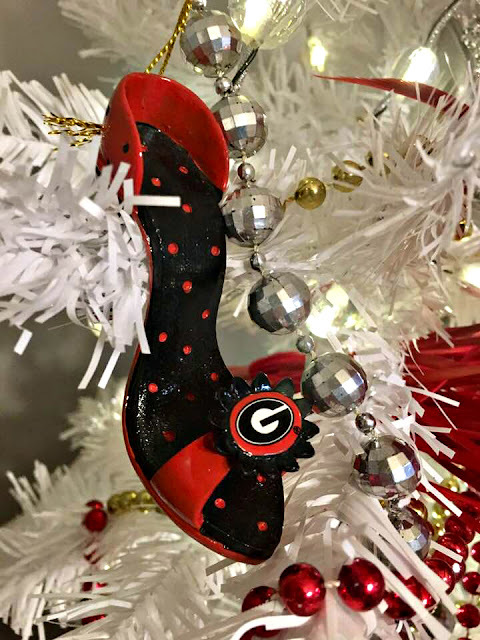 Needless to say, Elizabeth knew this would make this old Georgia Bulldog gal happy. I love the red hearts with silver and gold. Silver and gold...I keep thinking of the Christmas song that that Burl Ives sings....NOPE, it has nothing to do with Valentine's Day but it makes me smile. 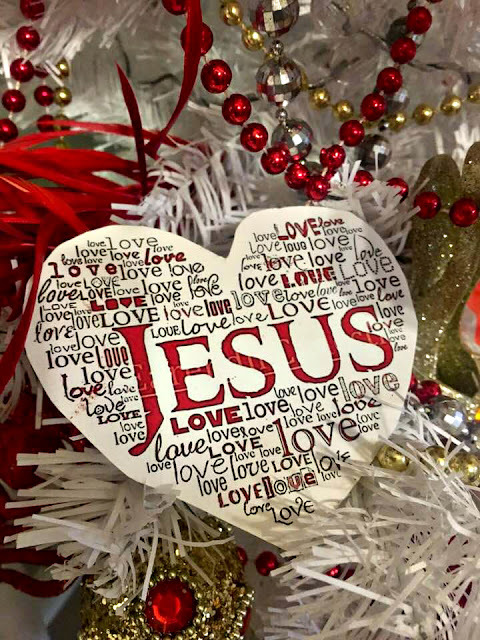 I just love my little Jesus hearts. I made these a few years ago and have used them in several different ways. They look adorable on my little tree. 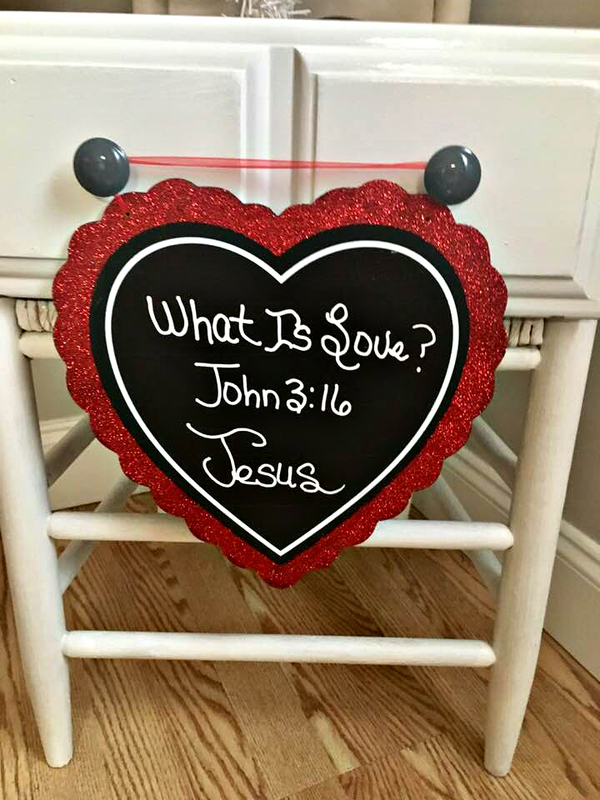 The little drawer sure worked out great for storing a few little Valentine Gifts in for my grandbabies. John 3:16 says LOVE perfectly. It's really pretty at night when all the lights are out and only the lights from the little tree are shining. It really doesn't take a whole lot to make this HEART of mine happy. Sandi, I totally get it! Girl, I had to stop collecting so much too years ago. I just couldn't keep HOARDING it all. LOL! 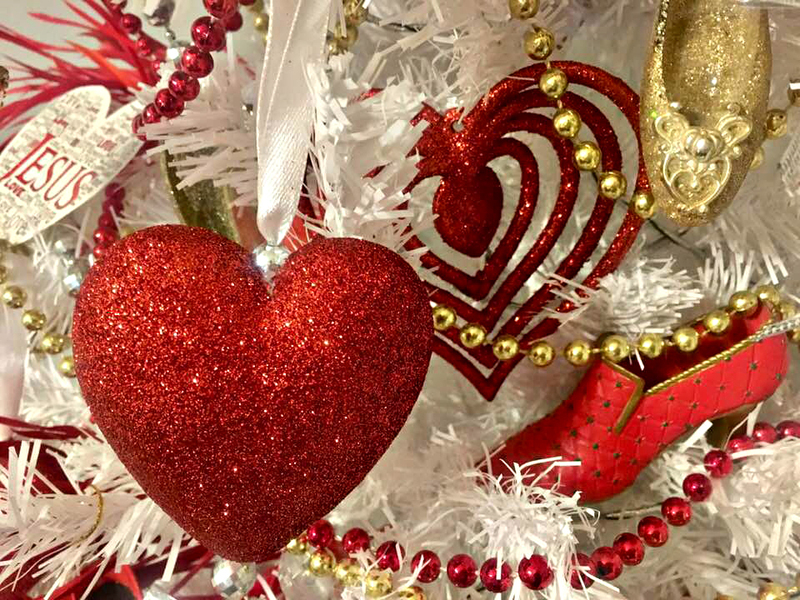 I bet your tree with the red is so pretty and you can enjoy that throughout Valentine's. How delightful Cindy! I love love your little high heel shoes!! 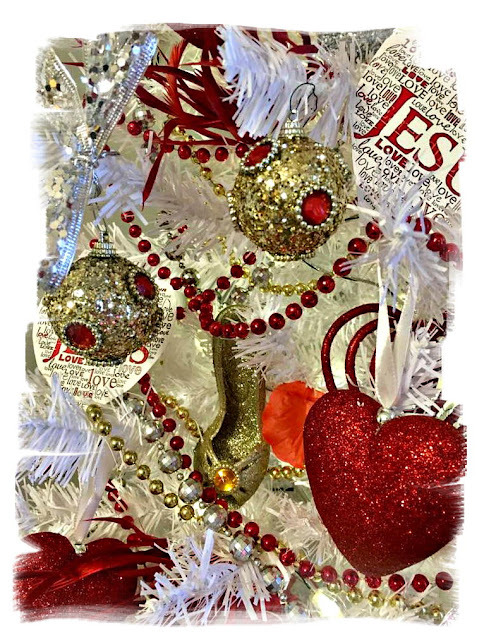 Your Valentine tree is not only beautiful but full of love and blessings! Thanks Jenna. I love those little shoes too! I am enjoying seeing it at night all lit up. Hi dear Cindy! What a sweet tree and I love that it sparkles and is all lit up! Okay, I am so crazy about the heels! Oh my heavens, each on is beautiful! I may have to start a new collection! Have a glorious day! We are having a chilly day in Florida Nancy. Quite a bit of rain last night too. Yep, that little tree does indeed sparkle. I am enjoying it. I totally agree with you in that it is the simple things in life that bring joy to our hearts. 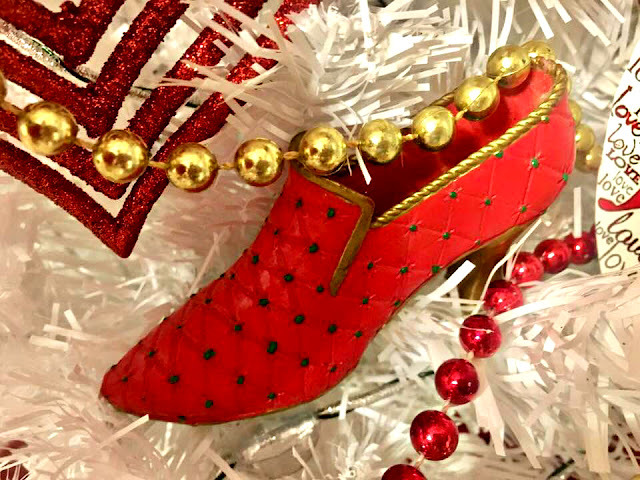 That precious little tree must be a real delight for you with all those pretty shoes, each having their own name and some with sweet memories,just too cute! That chair and drawer has certainly served good purposes in a beautiful way Cindy. Debbie, I am sure enjoying my little corner chair with drawer. Something so simple has been such a delight. LOL! One of my daughter's said the same thing Connie! 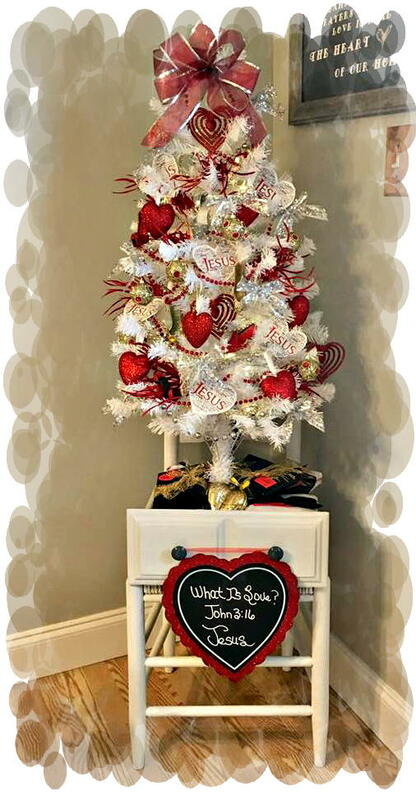 That really turned out so cute !Now I want a Valentine's tree! I miss the tree right about now. It's time to get out my reds and pinks and go all out for Valentine's Day. I'm ready!! I love my little tree Heather Lou. Makes me smile! Oh!!! What a really fun tree. I love that you have collected those little shoes. One of my daughter's friends has collected them for at least 20 years or so. I do think they are adorable...and your tree is as sweet as can be. I only have a few of the cute little shoes but I do love them. I may do a lipstick and show tree next year! LOL! So, so, so clever and fun! Thanks Christine. I had fun decorating it. Too Cute.. 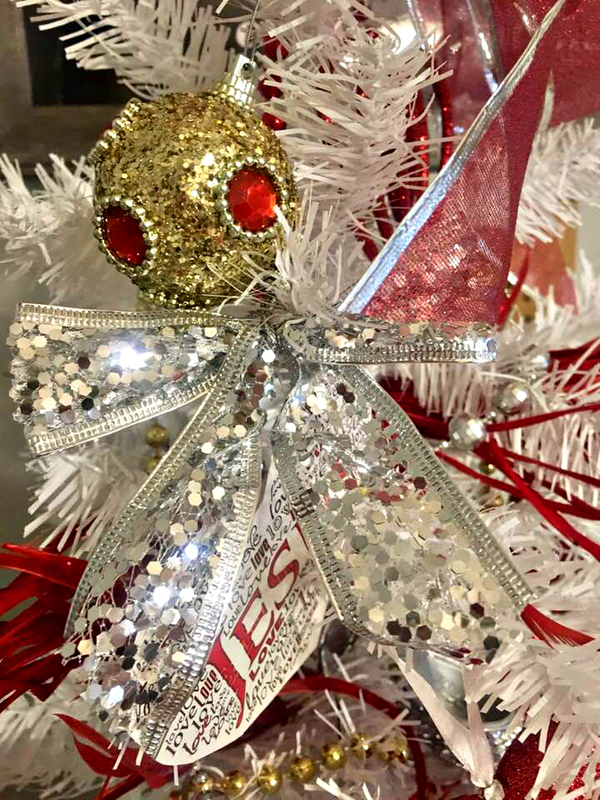 Your tree just brims with love and happiness.. and those little shoes are darling...it's so sweet that most of them were gifts . When the shoe fits Cinderella it doesn't get any better..Your post made me smile...Thanks and Valentine Hugs. Thanks so much. I am gonna have to get me a Cinderella shoe now! LOL! Hi Cindy! 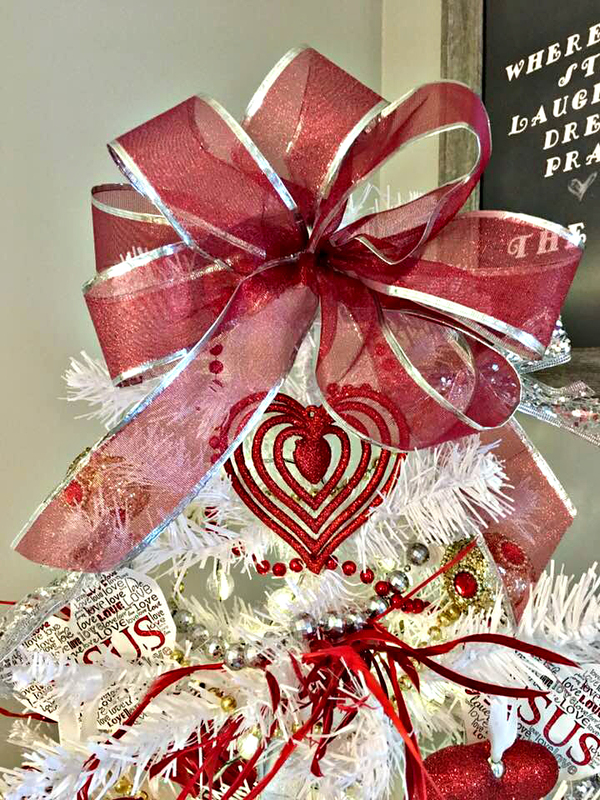 Your little Valentine tree is just so cute! The shoes sure add a sparkly touch. Next year I'm going to get a white tree so that I can decorate it after Christmas. I really miss my little bedroom tree. Thanks for the inspiration. We all need some fun in our lives, even for just ourselves. Love and hugs! Yes Kitty. Decorate you a tree! I miss my Christmas lights burning so I am glad I can at least walk into my kitchen at night and see the lights burning on this one. Of course I really want to sit there at the table and look at it but then means I will need to eat chocolate chips cookies! LOL! Oh my goodness! What a berautiful little Valentine's tree! Love the shoes...they are so glam and glitzy..and especially sweet because so many were special gifts to you. 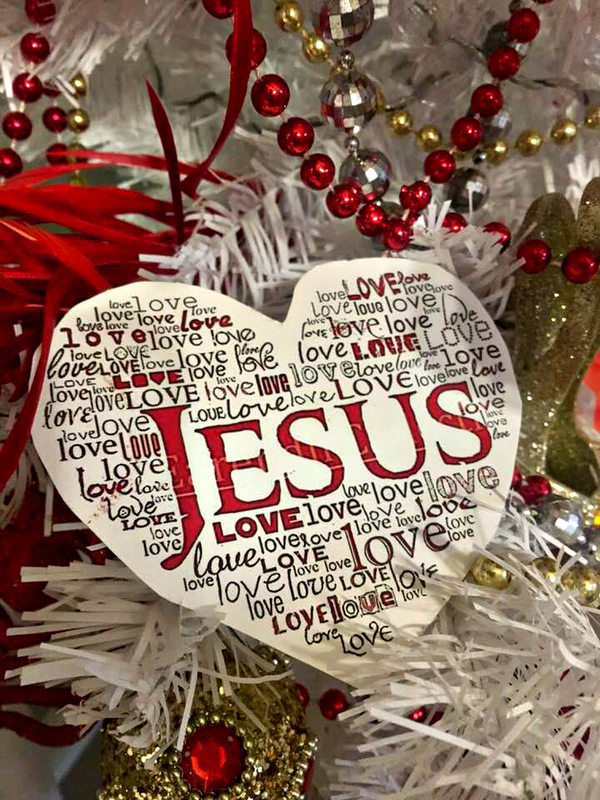 Love the Jesus hearts and all the rest. You make me smile! Thank you. Thank you Pam . I am surely enjoying my little tree my friend . That is just too cute and it would make me happy too. I do not decorate for Valentine's but I do make my famous fudge and pour it in heart molds and give to a few "lucky" folks. Happy, happy week Cindy! Yum! I might need some of that famous fudge . Cindy, I love this so much! 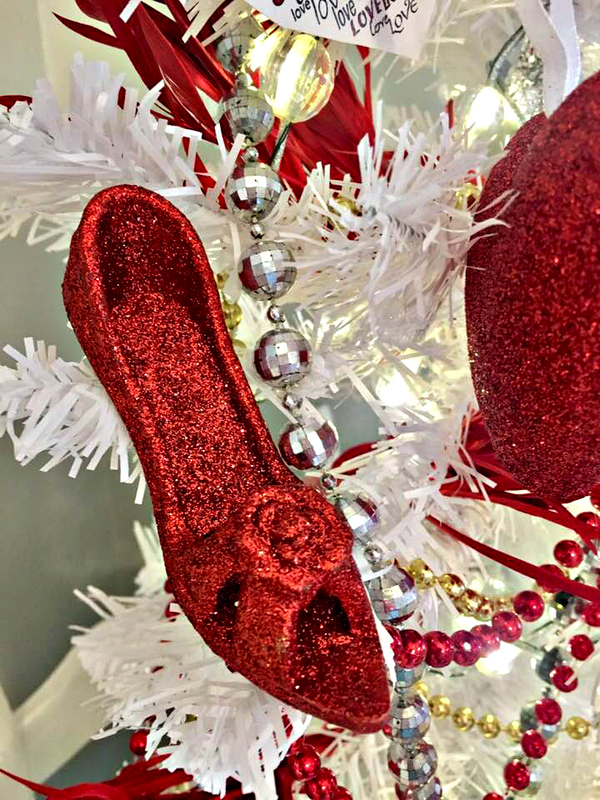 I always love a beautiful shoe, whether it is on a tree, in a window or on my foot! I'm short, so heels are always in my closet! 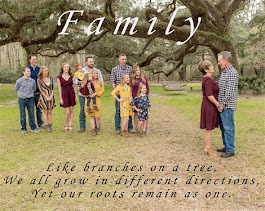 Honey, that tree is absolutely fabulous and what a wonderful idea! You are so creative, I don't care what you say! :-) The hubster and I have kicked around the idea of leaving the Christmas tree up all year round and just decorating for the seasons...really going to have to give this some serious thought now that I've seen your beautiful tree! Love and hugs sweet friend! Girl I’m short too . Gotta have a little height , right ? 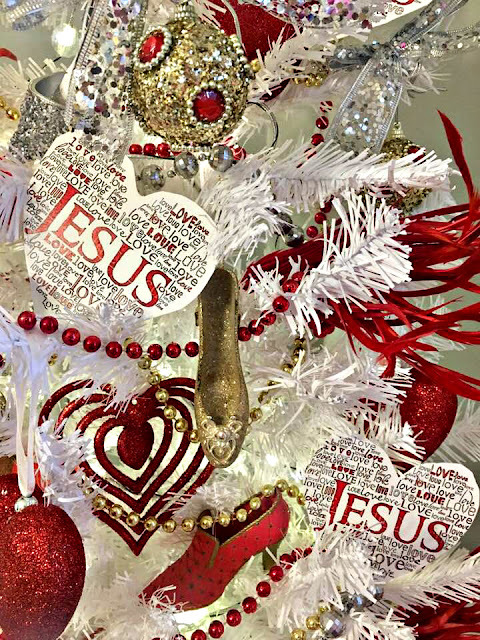 Decorate you a valentine tree . It will make you smile . I’m enjoying mine . I heart your super cute mini Valentine tree! 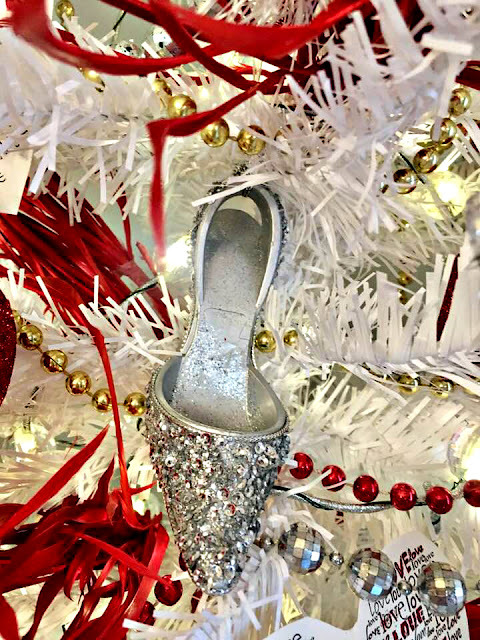 I'm too klutzy for heels, but can appreciate the pretty designs of your little shoe ornaments. I also liked how you named them. Thanks Margie . I am loving the little tree fur sure . Thanks Ashley . I love bling ! Oh I just this darling Valentine tree! There's no question that it says so much about who you are. Those little heels are just adorable! Love you, sweet friend! I love the heels! Such a pretty arrangement and I love that you have the tree sitting in the drawer. That is so cute. It worked out perfectly for the drawer Pam . I am enjoying it . 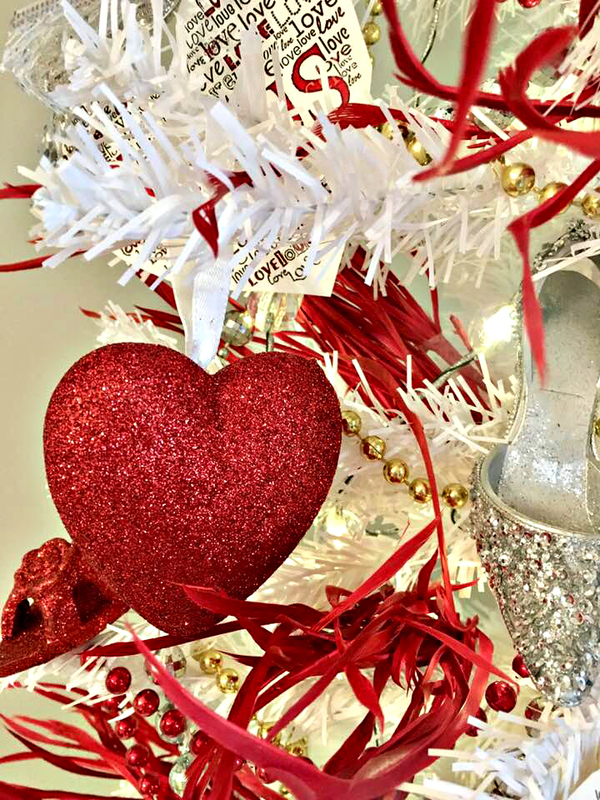 Cindy, your Valentine’s tree is just beautiful! I love your little shoes and their cute names. The chair and drawer are perfect for seasonal changes! 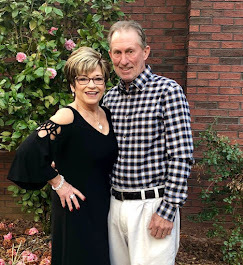 Hugs and blessings sweet lady! Thanks Pam. Yes, I am already pondering what to do in the corner for St. Patrick's Day. LOL! Oh be still my beating heart....I LOVE your tree!!! It is so sweet and valentiney!! I've thought about keeping a small tree to decorate for different occasions, just never have got it done....I am inspired. Thanks Miss Mary. With the tree being only 4 foot it doesn't take up much space or too many little things to decorate it with. I am enjoying it. O MY!! I love your sweet Valentine's Tree!! So cute!!! I love the heels and the hearts!! What a great combination!! And it look just perfect on that chair with the drawer that you love so much!! Thanks so much for stopping by!! Thanks Debbie. I knew you would love it. But you are the QUEEN of seasonal trees. I’m loving your drawer, too! It always fun to see how you’ve decorated it. I may have to create something similar since you’re having so much fun! Thanks Nancy. On the hearts, I found a free clipart on line a few years back and printed and cut out. I love wedges actually. Keeps me a little more stable. LOL! I am so short that I need a little height. Girl, I hate pantyhose and only wear them when I must! You sure know how to make that corner of your kitchen sparkle, my friend. Lovely...just lovely. The slippers are beautiful and I love how there is special meaning behind each one. You did a great job on the Jesus ornaments. Very clever. Have a wonderful remainder to your week, Cindy. Thanks Dianna. Love a little sparkle, glitter and bling. LOL! Your tree is just so pretty and I love the collection of shoes. Red is my favorite color and your tree showcases it perfectly. Thank you lady . I am op love red ! I love it!!! I had no idea you collected shoes. How adorable is that! 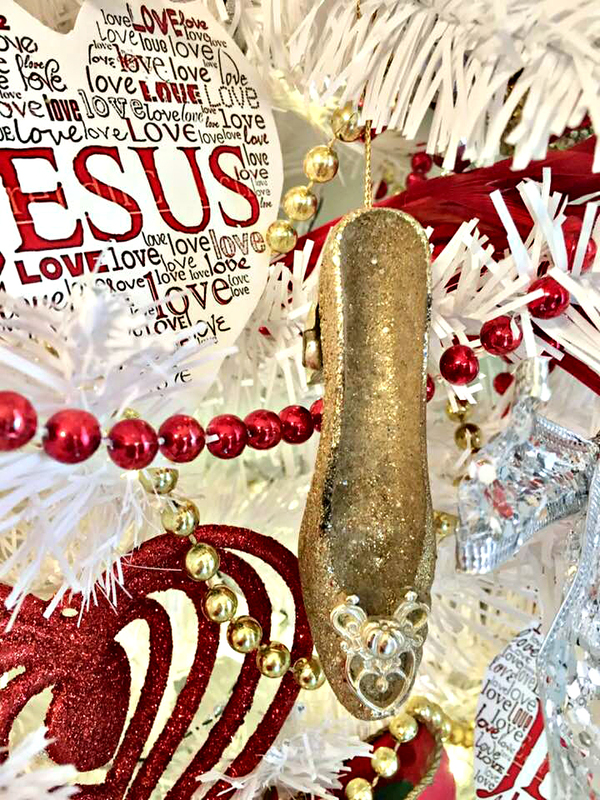 I wish I could find you a tube of lipstick ornament to go on your tree! 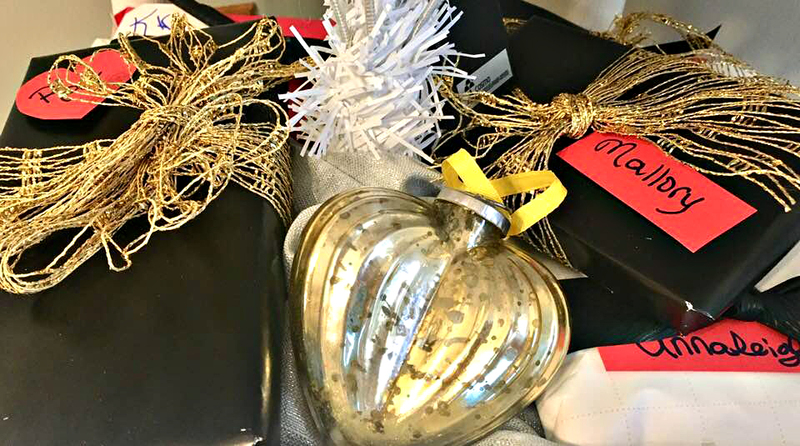 Your tree is just perfect, and you are on the ball, already having gifts for your grandbabies! I just put up my Valentine stuff this week and that's as far as I've gotten. But, with snow on the ground, it's hard to think about V-Day! 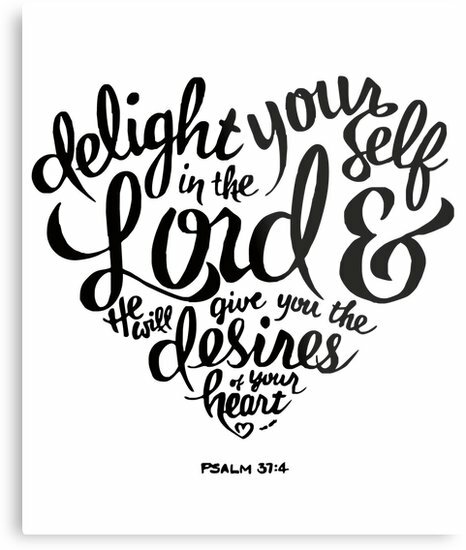 HOPE you have a wonderful weekend, sweet Friend. I don’t Deb . I’ve just had s few gifted to me and wanted to show case them . But i do live them . And .... i had a lipstick tube ornament given to me this past Christmas .😂 yep I’ll be using it to display somehow . Cindy that is one adorable tree. I think the addition of the heels is especially cute! And placing it on the drawer chair is genius. Now you make me want to find one of those drawers to make my own.